In BricsCAD V12, Bricsys added an on screen gizmo called the quad cursor to let users perform direct modeling operations. More information on the quad is here. 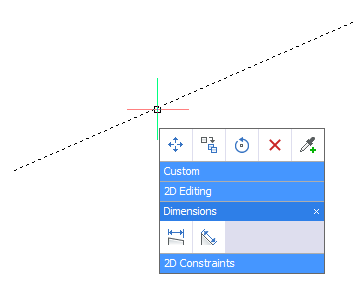 In BricsCAD V14, they have completely revamped it to a point where they really can’t call it a quad anymore. The way it works when you hover the mouse over an entity in the graphics window, a single button shows up containing a command that you will most probably use. For example, if I create a rectangle and extrude command is shown. As you move the mouse to the command the single button opens out to show other commands that you may want to execute. It acts more like an onscreen floating toolbar. The bottom of the toolbar has a down arrow which if hovered upon expands into a stack of attached toolbars. Hovering over the names of each toolbar opens it up to reveal the commands and closes the previously active toolbar. The key thing here is that you simple need to hover the mouse, not click it. The only time you click is when you want to invoke a command on a specific toolbar that you drilled down to. This new gizmo is not restricted to 3D modeling alone. It is available in the 2D environment as well and works the same way. Application developers can even use the BricsCAD C++ API to let their apps use the quad.